Jon-Eivind Lygren (DreamScreen/ScreenAcoustics), Eivind Lygren (DreamScreen/ScreenAcoustics), Sebastien Gailleton (Storm Audio), Chrisanne Rhodes (Storm Audio), Tom Back (Alcons Audio), David Rahn (Alcons Audio), Olivier Thumerel (Storm Audio), Walter Fortmüller (Alcons Audio) (left to right). 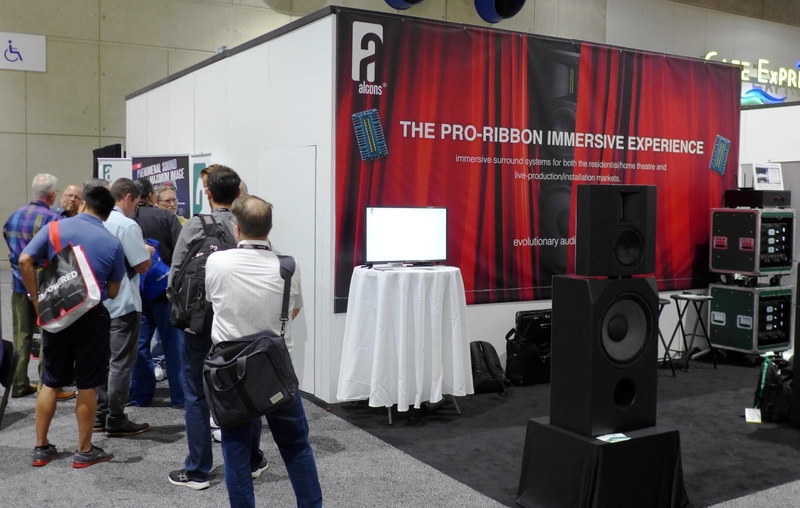 As Alcons Audio’s presence in the global home theater market continues to grow, 2018 marked the third year that the Alcons Pro-Ribbon Immersive Experience has been present at the annual CEDIA show, one of the premier showcases for the US home technology industry. 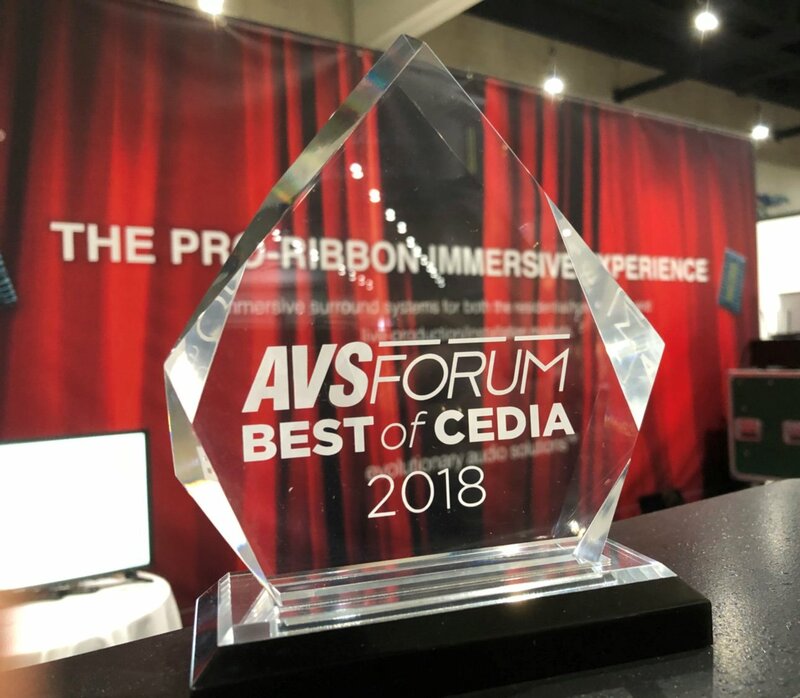 This year Alcons walked away with the prestigious Best Of Show demo award from AVS Forum, the world’s leading online information resource for residential AV equipment. The Alcons Pro-Ribbon Immersive Experience has been a highlight of CEDIA every year since 2016. This year, for the first time, it was hosted in a sound room on the tradeshow floor, allowing visitors to make more immediate and accurate comparisons with other systems. This made winning the AVS Forum award all the more rewarding for the Alcons team. 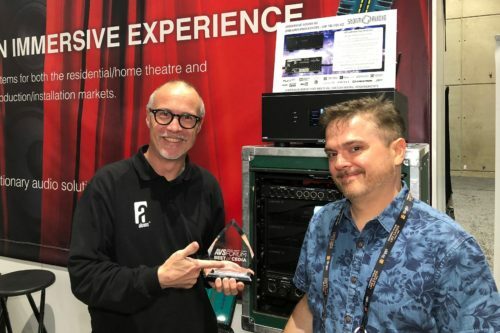 “The response to our CEDIA demos has got better each year and this year it was incredibly positive. There was a real buzz on the show floor and, although the demo was running every 30 minutes, everyone was packed and we had a line of people waiting for the next one throughout the show,” says Alcons US national sales manager David Rahn. 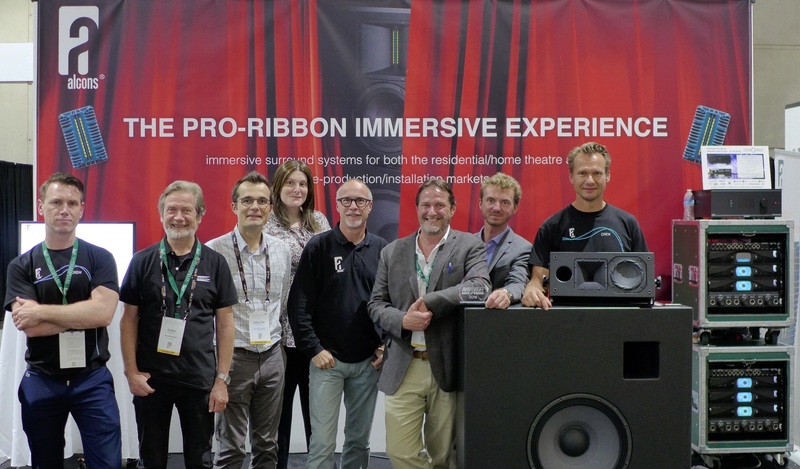 Featuring all-digital, lossless signal distribution from source to amplification, this year’s Pro-Ribbon Immersive Experience saw the full debut of the new CRMS LFE18 subwoofer, showcased in a 9.x.6 system. Four CRMS LFE18 were used with three CRMS mkII cinema reference monitor systems, eight CRMSC SRHV compact horizontal/vertical reference surrounds, two CRS8 medium format reference surrounds for front width channels and six Sentinel10 amplified loudspeaker controllers. 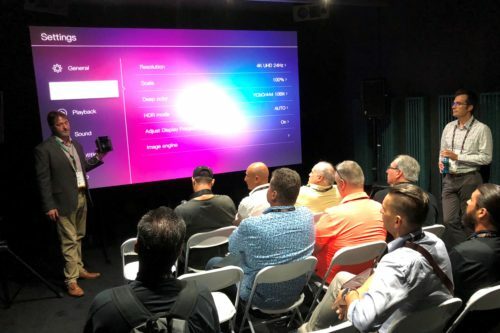 Audio processing was by Storm Audio’s ISP 3D.32 Elite Reference Édition immersive sound processor, with visuals courtesy of a Sony VPL-VW5000ES 4K home theater projector and ScreenAcoustics UltraWeave V6, fitted with the MotoMask PRO masking system. Each demonstration included a short introduction from each of the participating companies, followed by clips ranging from a classical, spacious Zubin Mehta concert to the largest explosions in the film Deepwater Horizon. Sound levels during this demo were much closer to regular reference and the experience really hammered home how dynamic and agile Alcons ribbons are. But even more impressive was the bass, which was palpably thick and heavy when it needed to be, or light and fleeting if that was called for. King Kong’s footsteps shook the room with an authority you’d expect from a wrecking ball, you could feel it in your bones. The CRMS-LFE18 18″ subwoofer is what’s new at the show and easily explains why the bass was so good this year. It’s a sealed design capable of 1.2″ of excursion, which means it can move lots of air. For more information, please visit www.avsforum.com, www.stormaudio.com , www.sony.com and www.screenacoustics.com.